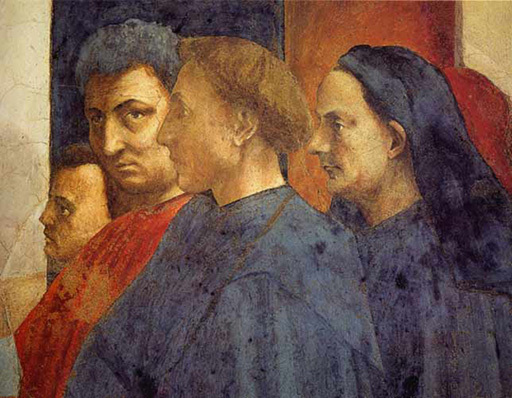 Masaccio, born Tommaso di Ser Giovanni di Simone (1401–1428), was the first great painter of the Quattrocento period of the Italian Renaissance. According to Vasari, Masaccio was the best painter of his generation because of his skill at recreating lifelike figures and movements as well as a convincing sense of three-dimensionality. There are several stories about Tomasso’s pseudonym. Some say the name ‘Masaccio’ is a humorous version of Maso [short for Tommaso], meaning ‘clumsy’ or ‘messy’ Tom, or even ‘slob‘. There is a rumour that he was given this nickname by Giorgio Vasari because Masaccio was so busy painting, he no longer cared for his personal hygiene. Another story is that Masaccio means ‘huge great Tom’ [it has the Italian augmentative ending]; the name may simply have been created to distinguish him from his principal collaborator Tommaso di Cristoforo Fini (c.1383–c.1447), also called Maso, who came to be known as Masolino da Panicale. Masolino means ‘little’ or ‘delicate Tom’, he was born in Panicale. See also Masolino da Panicale.